It was a week of showers, wind and bright sunshine in the Victoria Park cricket league, which saw Monday’s fixtures abandoned. On Tuesday, Friends CC posted another large total this time against Best Nationals. Striking 186-6 thanks to a superb 50 from Ajmal Afzal. As gloom set in and the wind turned the park into an October evening, Best Nationals were bowled out for 76, despite a spirited knock of 24 from Ravi Sagi. Millwall looked strong against Regents, thanks to some super hitting from Salman (54), ul-Karml Raza falling for 48 and a few last gasp sixes from Marhan which led to Millwall posting a formidable 195-6 off a reduced 15 overs. Regents batted through finishing on 65-6 with an enjoyable knock of 30 from Henrik Dineson. Masiha bagged their first win of the season over Sports Interactive. In a match reduced to 14 overs, Mashia posed a tricky 120, thanks to some superb hitting from Stuart (50). Keeper Peter Sottrel top scored for Sports Interactive with 17, as the chasing side fell short finishing on 77-5. Despite heavy downpours throughout Wednesday, the sun popped out to glisten across the park for the evening fixtures. Defending champions Rose & Crown kicked off their campaign against newcomers Ex-Pats. Batting first Rose & Crown struggled to get going and were helped immensely by a superb 50 from Charlie Challinor posting 133-4. Ex-Pats were left to rue their 33 extras as they lost by 33 runs hitting 100-6 with Mike McGhan striking a composed 39. Sky made it two out of two seeing off Crossrail by 30 runs, with brothers Mohamed and Noz Hussain hitting 52 and 40. Crossrail fell short despite 51 from opener Ed Hamlyn who was padded up and ready to re-join the battle before the overs ran out. 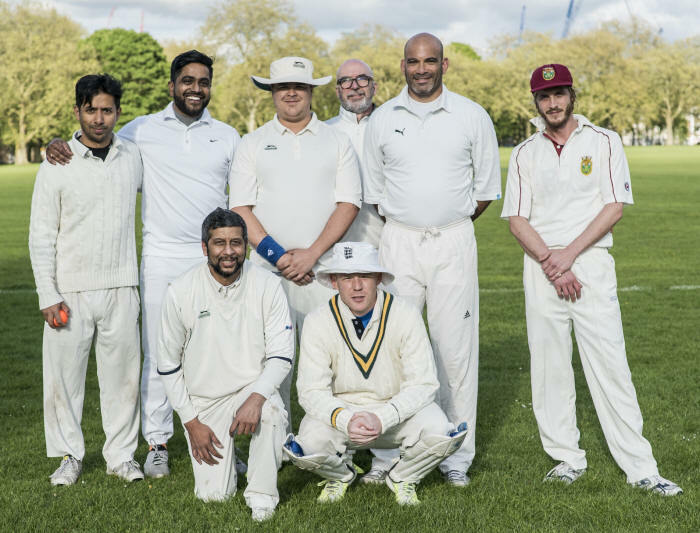 Newcomer Sarafat Ali starred for Stokey Scoundrels (153) as they defeated Homerton (111) all out, Mark Towle top scoring with 27 for Homerton. However, match of the week was reserved for Thursday. Camel Lights opted to bat first and hit an imposing 145-4, Brendan Clever 38 and skipper Tom Porter striking 33. In response L&Q lost two early wickets and with two men injured looked all but finished, until a superb partnership between Muhammad Hafeez who retired and came back in (57) and Aleem Hussain (34) stroked them to success winning off the final ball of the match in the gloomy evening.